CAMBRIDGE, UK, April 27, 2010 (ENS) – The world’s only three whaling nations – Japan, Norway and Iceland – could continue whaling for another 10 years, even while the current global whaling moratorium is retained, under a draft proposal released on Thursday by the International Whaling Commission. The proposal will come before the 88 IWC member countries at their annual meeting held this year in June in Agadir, Morocco. 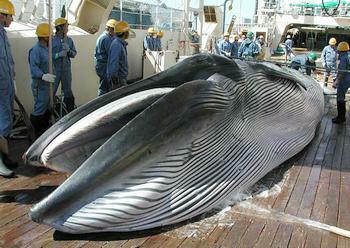 If adopted, the whaling nations would agree to catch limits set by the IWC that are below present self-set levels. They would also agree to an oversight and enforcement arrangement. As proposed, several thousand fewer whales will be caught over the 10-year period than would have been caught if the present situation of exceptions to the moratorium for “research” and commercial purposes. The proposal also creates a South Atlantic Sanctuary, which South American nations have repeatedly proposed at IWC meetings without success. It recognizes the non-lethal value and uses of whales, such as whale watching, as a management option for coastal states and addresses related scientific, conservation and management issues of such uses. Under the proposal, Japan’s current self-set annual quota of 935 Antarctic minke whales would be lowered to 400 over the next five years, then cut to 200 for the next five years. The country’s current quota of 320 sei and minke whales in coastal waters would be cut to 210. As drafted, the proposal would allow 69 bowhead whales, 50 sei whales, 12 Bryde’s whales, 145 gray whales, 14 humpbacks and 109 fin whales to be hunted each year around the world. No sperm whales could be killed. But this and all other catch quotas in the proposal are by no means definite. New Zealand Foreign Minister Murray McCully said the proposal “falls seriously short” of providing a realistic basis for a diplomatic solution to the whaling issue. 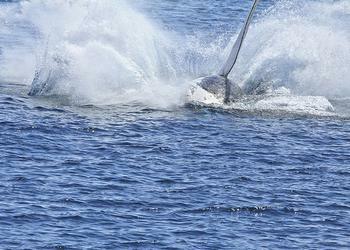 Environmental groups are opposed to any attempt to legitimize whaling in any form. During the 2009-2010 season in the Southern Ocean, Watson says intervention by the three Sea Shepherd ships saved 528 whales out of the 935 minke whales, 50 endangered fin whales and 50 endangered humpback whales for which the Japanese government had issued permits. No humpback whales were taken, only one fin whale was killed and 506 Antarctic minke whales were taken by the Japanese “research” vessels. “You cannot legalize commercial whaling in the waters south of 60 degrees without violating the Antarctic Treaty that prohibits commercial activity in the waters around the continent of Antarctica,” Watson said. “The IWC members now must take this proposal forward, end commercial whaling and transform the IWC into a body that conserves and not just manages whales,” said Sato. The proposal comes after several years of discussions about changing the IWC’s whaling management regime by a Small Working Group that includes the whaling nations. Last September, a Support Group was added to the discussions, including Antigua and Barbuda, Australia, Brazil, Cameroon, Germany, Iceland, Japan, Mexico, New Zealand, St. Kitts and Nevis, Sweden and the United States. Norway was invited by the chairman to participate as an observer.